Before you light it…know Ohio’s Open Burning Regulations. The Ohio EPA defines ‘Open Burning’ as any set outdoor fire that does not vent to a chimney or stack. You are open burning anytime you light an outdoor fire. In the past, many materials – including leaves, tree trimmings, tires and construction debris – were routinely burned outdoors. Materials containing rubber, grease, and asphalt or petroleum – for instance, tires, cars and auto parts, plastics, or plastic-coated wire. Garbage – any waste created in the process of handling, preparing, cooking, or consumption of food. Open burning is prohibited when air pollution warnings, alerts, or emergencies are in effect. No open burning can take place within 1,000 feet of an inhabited building located off the property where the fire is set. Nor can the fire obscure visibility for roadways, railroad tracks, or airports. Some types of wastes, such as leaves, branches, and grass clippings, cannot be burned in certain locations, known as restricted areas. Within the corporation limits and a one-mile zone outside any municipal corporation with a population of more than 10,000. Recreational fire (cooking for human consumption). In unrestricted areas, campfires under 3-ft diameter using clean fuel. Heating for warmth of outdoor workers and strikers (restricted to 55-gallon drum). BONFIRES: ceremonial fires limited to 5 feet by 5 feet, less than three hours duration, and must only contain clean, dry fuel. Not for waste disposal. AGRICULTURAL WASTES: material generated by crop, horticultural or livestock production practices. This includes fence posts and scrap lumber, but not buildings. LANDSCAPE WASTES: plant matter such as tree trimmings, branches, stumps, brush, weeds, leaves, grass, shrubbery, yard trimmings and crop residues. LAND-CLEARING WASTES: plant matter which is removed when land is cleared for residential, commercial, or industrial development. This material may be burned only under certain circumstances and WITH PRIOR WRITTEN PERMISSION FROM OHIO EPA and a permit from the FIRE DEPARTMENT. RESIDENTIAL WASTES: wastes such as wood or paper products that are generated by one-, two- or three-family residences. Garbage may NOT be open burned. EMERGENCY FIRES: for disposal of waste resulting from major storm or disaster damage. This material may be burned only under certain circumstances and WITH PRIOR WRITTEN PERMISSION FROM OHIO EPA and a permit from the FIRE DEPARTMENT. What will happen to me if I am caught illegally burning? Ohio EPA and the Oberlin Fire Department has the legal authority to enforce the open burning laws. Violations can result in substantial penalties, including the cost of extinguishing the fire. 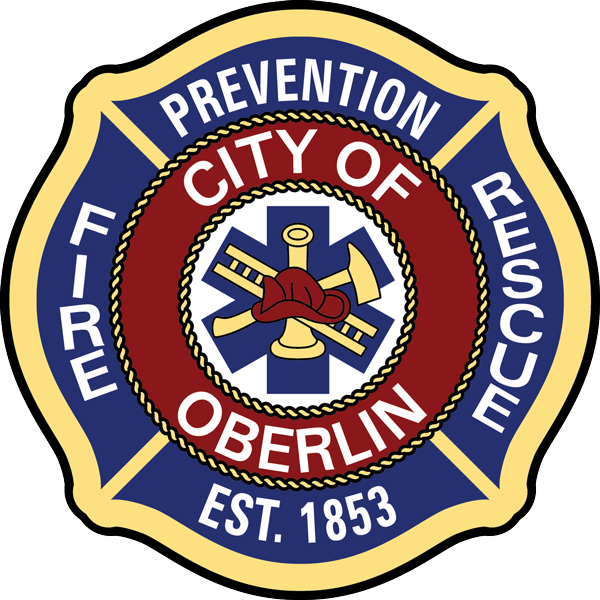 Violators within the City or Township can be issued a fire code citation to Oberlin Municipal Court or a citation directly to the State Fire Marshal. Fire code violations are first degree misdemeanors subject to fines up to $1,000 per offense and imprisonment up to six months. Be sure to OBTAIN A PERMIT from the fire department before you begin to burn.